To be ready for the mission, anywhere and with a full operational capacity, is one of the main concerns of today’s navies. Thus, their unmanned systems are meant to be easily deployable, from the mothership, an opportunity vessel or ashore – the transportability is a must. That is the reason why, from the beginning, ECA GROUP designed its UMIS (Unmanned MCM Integrated System) as a modular and compact “toolbox” of drones, configurable according the mission. UMIS is a comprehensive naval drones system developed by ECA GROUP and adopted by several navies such as Belgium and Netherlands, a NATO reference for mine clearance missions at sea. UMIS is composed of naval drones (USV/AUV/ROV/MIDS), their autonomous systems (LARS – Launch And Recovery Systems) and a new generation of command and control (C2) software suite UMISOFT which makes this system totally integrated and autonomous for standoff mine warfare. Operators are safe while controlling a situation from the distance via radio communication and receiving information or data gathered by the USV or AUV and ROV. According the mission, the environment or other constraint, they choose their drones configuration (the team) and deploy it to work autonomously or remotely operated on the battlefield. Of course, crucial decision (neutralizing the mine) are still being made by the operator. 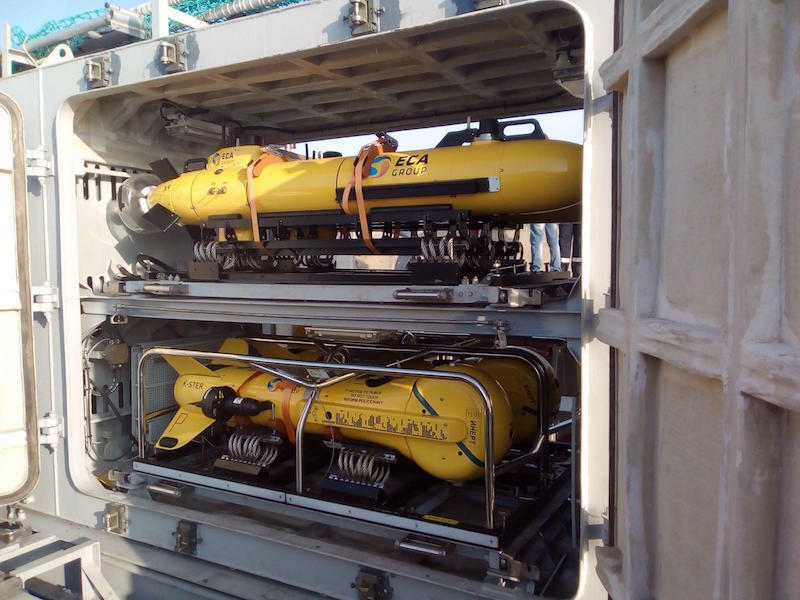 Each naval drone, each autonomous or remotely operated equipment of a ECA GROUP drones system, integrates an embedded UMISOFT module which is linked to the main supervision core dispatched in the control consoles of the operation center located onboard the mother ship or ashore. UMIS Containerised is a flexible and stand-alone unmanned solution. To meet navies’ requirements and their logistic constraints, ECA GROUP designed specific storage and transportation equipment for each possible configuration. The containerized facility can be deployed in coastal areas, canals, ports and harbor entrances. A typical UMIS Containerised configuration can be made of a dedicated C2 container and its “tools” dedicated containers for several drones of the “team”. The C2 container will be deployed on land or on a non-dedicated ship (COOP or NATO), while the drones will be able to be deployed from beaches, river banks, port docks, etc. The main functions of the C2 are to operate the drones like USV INSPECTOR 125, mid-size AUV A18-M, towed sonar T18-M, MIDS configuration made of inspection ROV SEASCAN and the “mine killer” K-STER and men portable AUV A9-M and its equipment such as LARS. A complete UMIS Containerised configuration is air-transportable and can be deployed very quickly anywhere in the world. It is fully compliant with safety and transportation norms. This solution is already used by several world’s navies.